All vendors will be allowed to set up Thursday July 4th between 8:00am and 10:00pm and must be set up by 12:00pm on Friday July 5th, 2019. The Jeep Fest will officially start at 12:00pm on Friday July 5th and end at 3:00pm on Sunday July 7th, 2019. Ohio Jeep Fest hours are Friday 12:00pm – 8:00pm, Saturday 9:00am – 7:00pm, Sunday 9:00am – 3:00pm. Deadline to register is June 30th, 2019. Donations can be dropped off at the Ohio Jeep Fest office upon arriving to the event. Vendors and Sponsors will be required to go to the OJF office and sign for your passes for the event. Each vendor will receive 4 wristbands for employees. Additional wristbands are available for the cost of general admission for that day of the event. Electric is included. Vendors supply their own extension cords that meet local code requirements. Vendors must supply their own tables and chairs for their booth. If you are unable to join us for the 3rd annual Ohio Jeep Fest please consider becoming a sponsor. We have great sponsorship packages that will allow you to still be a part of the event. Merchandise vendors will have special parking inside the event located beside the vendor area that requires a vendor parking pass. Each vendor will receive 1 parking pass with their booth rental. Up to 2 additional vendor parking spaces can be purchased for $10.00 each. Setup may start Thursday July 4th, 2019 between 8:00am and 10:00pm and completed by 12:00pm Friday July 5th, 2019. No vehicles will be permitted to operate in the vendor area after 12:00pm Friday July 5th, 2019. Vehicles may not operate through the vendor area during festival hours, except in the event of an emergency or a demonstration for retail purposes which must be escorted by an event manager. All advertising must be done within your own booth space. 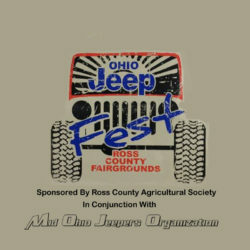 All other areas are reserved for event advertising by the Ross County Agricultural Society and Mid Ohio Jeepers Organization. All music and sound must be kept at a reasonable volume. All electrical hookups will be overseen by the event electrician. 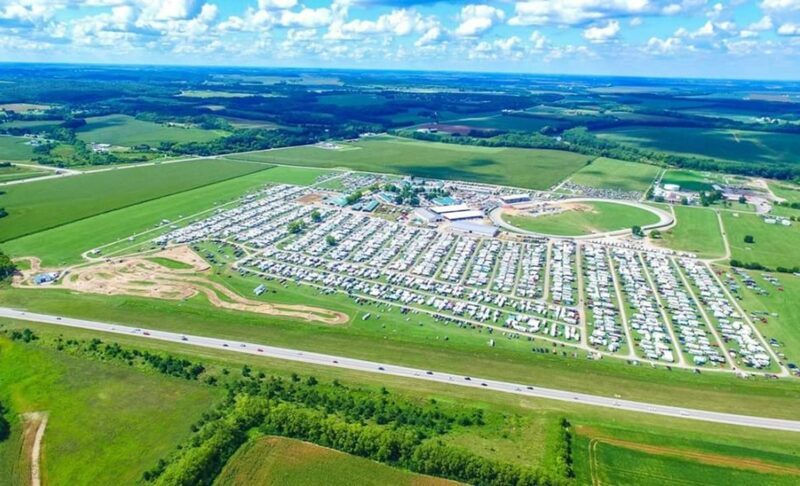 Ross County Agricultural Society is not responsible for any injuries or damage to any person or property, including any lost, stolen, or damaged merchandise, possessions, or vehicles, caused by any member of the society, volunteer, vendor, camper, or person attending the event. Profane language, excessive noise, or disorderly conduct of any type will not tolerated. Any of these is sufficient reason for expulsion from the vendor area of the event and fairgrounds, without refund of any vendor fees. “If a vendor writes a check with insufficient funds, a $35.00 fee will be added to the amount of the check. *Failure to follow Ohio Jeep Fest rules will result in immediate expulsion from the festival with no refund. All vendor packages will be required to be picked up and signed for at the OJF office upon entering the fairgrounds. This can be done at the same time as dropping off your donation to the raffle for Saint Jude’s Children’s Hospital.